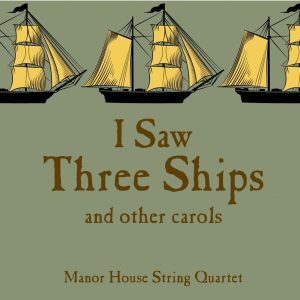 O Come, O Come Emmanuel for String Quartet – ‘O Come, O Come Emmanuel’ is included on the Manor House String Quartet‘s first album of string quartet Christmas Carols entitled ‘I Saw Three Ships and other carols’ and is arranged by violinist Vaughan Jones. This haunting melody is thought to have originated in France in the 13th century and added to a latin text which dates from a century earlier. The text is based on the biblical prophecy that states that God will give Israel a sign that will be called Immanuel (which literally means ‘God with us’). In the mid 19th century it was translated into English by John Mason Neale. This arrangement starts with a drone in fifths which alternates between the cello and viola with the melody played in octaves between the two violins. The cello then is given the melody before it is passed to the upper three parts in homophonic harmonies which hopefully evoke the mediaeval origins of the carol. It is a subtle yet memorable melody which has remained popular through the centuries and adds a religious weight which balances against some of the more light hearted Christmas tunes on the CD.